Astronomers used X-ray data from NASA’s Chandra X-ray observatory and ESA’s XMM-Newton satellite as well as ultraviolet data from Sloan Digital Sky survey (SDSS) and found evidence that dark energy is getting stronger with time!! Dark energy has been proposed from theoretical astrophysicists as an explanation for the accelerated expansion of the universe. If it really exists it should account for about 70% of the composition of our universe. In a recent study, scientists used a new method to determine distances to quasars. Quasars are galaxies that host an extremely luminous supermassive black hole in their centre. They measured distances of about 1600 quasars. Some of them existed when our universe was only 1.1-2.3 billion years old. The current age of the universe is about 13.8 billion years. 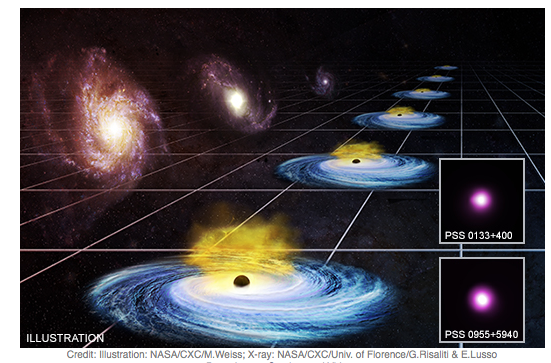 Their analysis revealed that the expansion rate of the universe is faster than what was expected! This may suggest that dark energy is getting stronger as the universe becomes older. If their result is confirmed it means that the dark energy is not constant, as we think today!! It could also explain the discrepancy between the value of the Hubble constant, the rate that cosmos expands, derived using the Cosmic Microwave Background (CMB) and using local indicators! !